BACKGROUND AND PURPOSE: Neutrophil Extracellular Traps (NETs) are DNA extracellular networks decorated with histones and granular proteins produced by activated neutrophils. NETs have been identified as major triggers and structural factors of thrombosis. 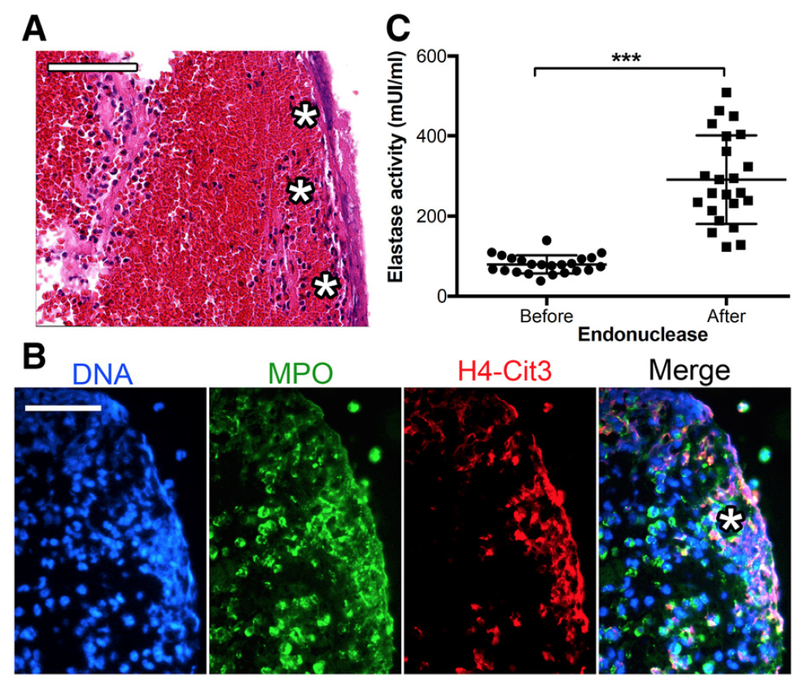 A recent study designated extracellular DNA threads from NETs as a potential therapeutic target for improving tissue-type plasminogen activator (tPA)-induced thrombolysis in acute coronary syndrome. The aim of this study was to assess the presence of NETs in thrombi retrieved during endovascular therapy in patients with acute ischemic stroke (AIS) and their impact on tPA-induced thrombolysis. METHODS: We analyzed thrombi from 108 AIS patients treated with endovascular therapy. Thrombi were characterized by hematoxylin/eosin staining, immunostaining, and ex vivo enzymatic assay. Additionally, we assessed ex vivo the impact of deoxyribonuclease 1 (DNAse 1) on thrombolysis of AIS thrombi. RESULTS: Histological analysis revealed that NETs contributed to the composition of all AIS thrombi especially in their outer layers. Quantitative measurement of thrombus NETs content was not associated with clinical outcome or AIS pathogenesis but correlated significantly with endovascular therapy procedure length and device number of passes. Ex vivo, recombinant DNAse 1 accelerated tPA-induced thrombolysis, whereas DNAse 1 alone was ineffective. CONCLUSIONS: This study suggests that thrombus NETs content may be responsible for reperfusion resistance, including mechanical or pharmacological approaches with intravenous tPA, irrespectively of their etiology. The efficacy of a strategy involving an administration of DNAse 1 in addition to tPA should be explored in the setting of AIS. CLINICAL TRIAL REGISTRATION: URL: http://www.clinicaltrials.gov. Unique identifier: NCT02907736.